That 2017 was a bad year for disasters in the U.S. is a given. Now the federal government has classified it not just as a bad year, but the worst. Data released on Monday by the National Oceanic and Atmospheric Administration show that 2017 saw $306 billion in weather- and climate-related costs, the highest total ever recorded for the country. Last year was also the third-hottest on record for the country. That marks 21 years in a row above the 20th century average, meaning if you’re a senior in college, you’ve yet to experience a cooler-than-average year. The past year completely rewrote the record books for all kinds of losses. A record-tying 16 billion-dollar disasters hit the U.S., including three of the top five most destructive hurricanes. Up until the carnage of 2017, 2005 held the record for costliest disaster year, owing to Hurricane Katrina. Losses from all billion-dollar disasters that year topped $214 billion. In comparison, the 2017 hurricane season alone caused $265 billion in losses. Hurricanes Irma, Maria, and Harvey all jumped into the top five most destructive hurricanes of all time, with Harvey occupying second place on the list at $125 billion. The costs from Maria are still mounting as Puerto Rico suffers through the longest blackout in U.S. history, and continues to grapple with the humanitarian crisis a dearth of power and clean water has precipitated. Not to be outdone, the 2017 wildfire season was also the most costly ever recorded. Nearly 10 million acres burned across the U.S., causing an estimated $18 billion in losses. That’s more than triple the previous record, and it was driven largely by the Wine Country Fires that combined to destroy more than 8,300 structures. The list doesn’t even include the Thomas Fire, which is California’s largest and seventh-most destructive wildfire in state history. 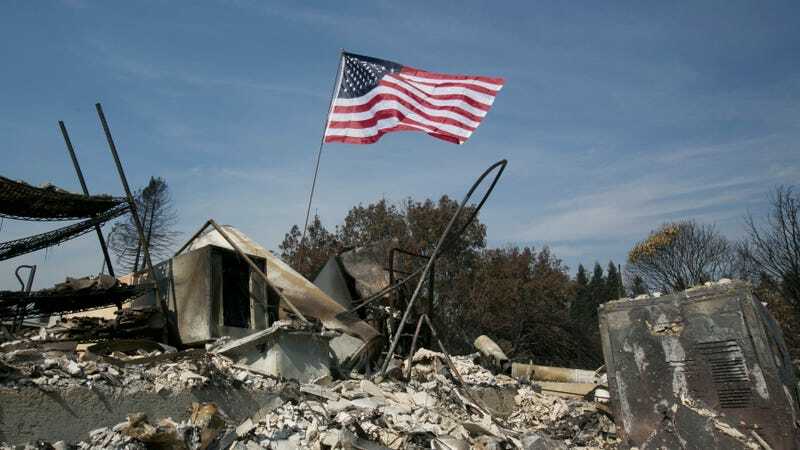 Adam Smith, an economist with NOAA, said the total losses include what we’re paying for disaster response, including the record amount of money the federal government spent in 2017 to respond to wildfires. The announcement follows a report that natural disasters around the world led to a record $135 billion in insured losses last year. The major costs reflect a couple realities. The first is that we choose to live in dangerous places. Nearly 40 percent of the U.S. population lived in counties directly on the shoreline in 2010, a number that NOAA expected to rise 8 percent by 2020. That was all fine and good when the U.S. was in the midst of a hurricane drought. But when this year’s destructive hurricane season hit, it translated into record losses. The same is true for growing populations at the urban-wildland interface. Neighborhoods popping up in fire-prone places mean more people and property are at risk when wildfires actually start. More power lines going through those areas has only increased the risk. But as much as we live in dangerous places, we also live in dangerous times. The world is warming, and our weather is changing. That certainly contributed to the fact that 2017 was the third-warmest year for the U.S. in 123 years of record keeping, trailing only 2012 and 2016. Not a single state was cooler than average. While NOAA hasn’t released its global data yet, other global temperature data keepers peg 2017 as the second or third warmest year on record. Widespread, persistent heat is our clearest signal of climate change. “We’re still going to see blue blobs on the map but when they average out with pinks and reds, we end up with a pretty warm year,” Deke Arndt, the chief of climate monitoring at NOAA’s National Centers for Environmental Information, said. But climate change also almost certainly played a role in some of the weather disasters. Scientists are already teasing out linkages between Harvey’s record rainfall and climate change. And research has shown how rising temperatures are making wildfire seasons longer and more destructive. The record year for weather and climate disasters is a reminder that we’re not waiting for climate change to hit anymore. We’re living it.